For those who haven’t yet noticed, WordPress now adds rel="noopener" attributes for any external links added via the link Quicktag in the Visual/RTE. 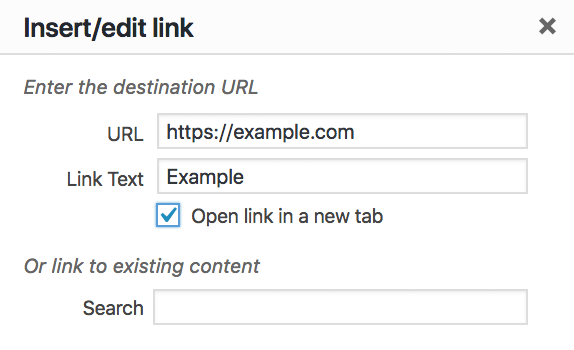 So if you enable the option, “Open link in a new tab”, WordPress automatically will add the rel noopener attribute to the link. This is to protect against CORS and other exploits that take advantage of blank-target links. It’s a smart move that may escape many in the WordPress community. So in an effort to help foster understanding, this post explains how it works and why it’s beneficial, and then explains some ways to workaround, enhance, disable, etc. And for those with Code Inspecting Powers (CIP), you can examine the actual link markup via your browser: Example. Notice the noopener included in the anchor markup? That tells supportive browsers to disown the opened page, which in turn protects against any possible exploits. The keyword here is “supportive browsers” — not all browsers yet support noopener. Important: WordPress only includes rel noopener on links added via the Insert Link tool. So remember to include rel="noopener" on any blank-target links that are added manually (i.e., any links added without using the Insert Link tool). This includes ALL web pages, not just those powered by WordPress. Used in WordPress core, the Tiny MCE (Visual/RTE) script adds the rel-noopener attribute to help protect against a potential CORS vulnerability involving blank target attributes on anchor elements. In plain English, adding target="_blank" to your links is considered unsafe, so WordPress now adds rel="noopener" to inserted blank-target links to protect against CORS and other exploits. Such exploits also are referred to as “link jacking”, “tab nabbing”, and similar names. Among myselves, I simply refer to it as the “blank-target issue”. So how does it work? Glad you asked..
Blank target is an issue only for untrusted links. As with the pervious example, in order for this blank-target link to be exploited, the attacker must have control of the page located at https://some-obscure-random-site.com/cool-thing/. If the attacker does not have control of that web page, the blank-target link is totally safe. The main thing to understand is that, in order for blank-target links to be unsafe, the attacker needs control of the target page in order to execute their script. Otherwise there is no threat and the blank-target link is completely safe and secure. So it’s all about trust: do you 100% trust the pages that you’re linking to? If so, you have absolutely nothing to worry about. YES that’s really what the blank-target hack is all about. Whether or not the pages that you link to via target-blank will ever be compromised by link-jacking bandits. Like if you link to big corporate sites, your blank-target links probably are pretty safe. But if you link to smaller sites that may be more likely to fall under the influence of bad actors, then there is a greater risk that some lowlife would actually attempt some link-jacking buffoonery. The problem of course is that, web pages that are trusted today may fall prey to bad actors in the future. So even though there are specific cases and scenarios where external blank-target links always will be trusted, it is recommended to treat all blank-target links as unsafe. If possible, simply avoid using target="_blank" on any links anywhere, ever. This is simple to implement and literally eliminates the vulnerability 100% done. And for any external links that absolutely must be opened in a new tab, use rel="external" instead. Add the rel="noopener" attribute to any blank-target links. Like WordPress does with blank-target links inserted via the Insert Link tool. Using the rel-noopener attribute protects blank-target links in the latest versions of all major browsers. Unfortunately, support for rel-noopener only goes back so far. Older versions of Chrome, Firefox, Opera, Safari, IE (et al) do NOT support rel nopener, so extra support is required to secure blank-target links for older browser versions.